Please consider supporting our Veterans by buying a ticket in the RSL Art Union. 1. Good Morning Boys and Girls, Teachers Parents and guests to Dalmeny Primary School ANZAC Day service. And thank you for your introduction and the invitation to speak here today. 2. When the First World War started in 1914 it was a long way from Australia. Germany declared war on Russia and France and England came to their aid also declaring war on Germany. 3. The young Aussie men at the time saw this war as an opportunity to have a great adventure, to travel and see the world. They volunteered for Army service and many lied about their age at only 15, 16 or 17 saying they were over 18 to enthusiastically go on what they saw as an adventure of a lifetime. 4. When their mothers or girlfriends cried because their men were going to war, the young soldiers said”Cheer Up, We will send the Germans packing and be home in time for Christmas.” And with this light-hearted attitude they signed up to the forces. 5. Many of these young men had never left their home towns before let alone gone overseas to another country so it was with great excitement that they boarded a ship from Western Australia to head off to the British training camps. 6. The training camps in England were already full of British trainees so the Australians were sent to the hot, sandy desert of Egypt for their training. After their gruelling training was finished they were very excited to be finally joining the war for real. The Fresh-faced Australian volunteers were sent to the Gallipoli Peninsula in Turkey by ship alongside soldiers from England, France and New Zealand. Turkey had allied with Germany in the war and was seen as a weak force that could be easily overcome. 7. When the Australian Soldiers landed on the beach at ANZAC Cove in the first light through the early morning fog of 25 April 1915 they thought they were going to land on a quiet beach where they could prepare for an attack on the Turks. It didn’t take long for them to realise how wrong they were. The youthful soldiers were attacked by mortars and machine guns in their boats before they even reached the beach. When they finally did reach the beach they had to run for their lives to try to find cover from the well prepared Turks who had strong defensive positions high up on the hills overlooking them. 9. Allied soldiers fought to gain control of the Peninsula in Turkey for the following 8 months before they were withdrawn. It was not a victory but it was the place of many heroic acts and the creation of a legend of hard fighting, courageous, brave and dedicated soldiers of the Australian And New Zealand Armed Corps (ANZACS). These soldiers valued their mates and mateship above all else, a quality so important they would protect it with their very lives. 10. Many soldiers performed incredibly brave acts during this time creating a legend which we now call the ANZAC spirit. There is no better example of this than a young man named Simpson. It was his job to go onto the battlefield and bring wounded soldiers back to be treated. He went into the most dangerous areas of the peninsula with his donkey, often through areas of machine-gun and mortar fire to rescue his fellow ANZACs. Simpson returned to the battlefield time and time again with his donkey and is believed to have rescued about 300 men before he was shot and killed himself by Turkish gunfire on 19 May 1915. 11. The ANZACs were withdrawn from Turkey in December 1915. In the 8 months of fighting the allies’ casualties number around 180,000 wounded or killed. Australian forces had lost 26,000 men of which 8,000 were killed. New Zealand had lost 7500 soldiers of which 2500 were killed. It is believed the Turks lost around 218,000 soldiers dead or injured. 12. Today, as we remember these brave soldiers from ANZAC Cove, we should also spare a thought for all soldiers who have died in conflict. We also remember there are Australian Soldiers currently away from their families serving overseas on operations in many countries around the world today. Australian soldiers are serving in Iraq, Afghanistan, Solomon Islands, East Timor, Sinai Peninsula - Egypt, Sudan, and the Middle East. The virtues of Courage, bravery, resourcefulness and Mateship forged by the ANZACs in 1915 are still valued by these Aussie soldiers all over the world today. 13. I suppose if there is one message we would like to get from this story it is this, no matter how hopeless things look, no matter how hard things get, always give everything your best shot, and that is all that anyone can ever expect of you. 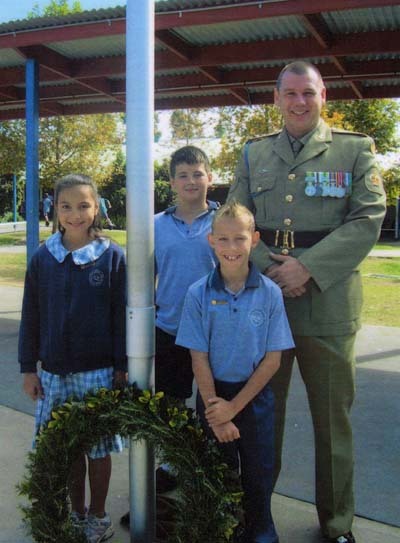 Chris (My Son) and Myself in a picture with two students from the Student Council at the Dalmeny Primary School ANZAC Day Assembly - 2008. For more on my life in the Australian Army look here: www.pva68.com/Army. Win a Million Dollar Home - Support Australian Charities.